A Mikoyan Gurievich MiG-23 Flogger sits in front of an Antonov An-26 transport at the Museo Nacional del Aire (National Air Museum), Avenida 212 y La Coronela, Cubanacan. The museum contains a spendid array of military and civilian aircraft, plus models and exhibits recording notable moments in Cuban aviation history. The MIG-23 is a variable-geometry wing configuration supersonic fighter and was built between 1969 and 1985 in two factories (Moscow and Irkutsk) in Russia. The Cubans received the first MiG-23 on June 6, 1978. They were 14 MiG-23BN Flogger H and 2 MiG-23UB Flogger C. This first Squadron was for the 231° Regiment at San Antonio of the Baños. The MiG-23 appeared for first time in public during the military parade of January 2, 1979, celebrating the 20th Anniversary of the Revolution. In spite of the bad weather conditions (rain, low visibility), 9 MiG-23BN at the command of the Colonel Rafael del Pino passed over Revolution Square in three groups (Troikas) with the variable geometric wings in three different positions: 16°, 45°, 72°. 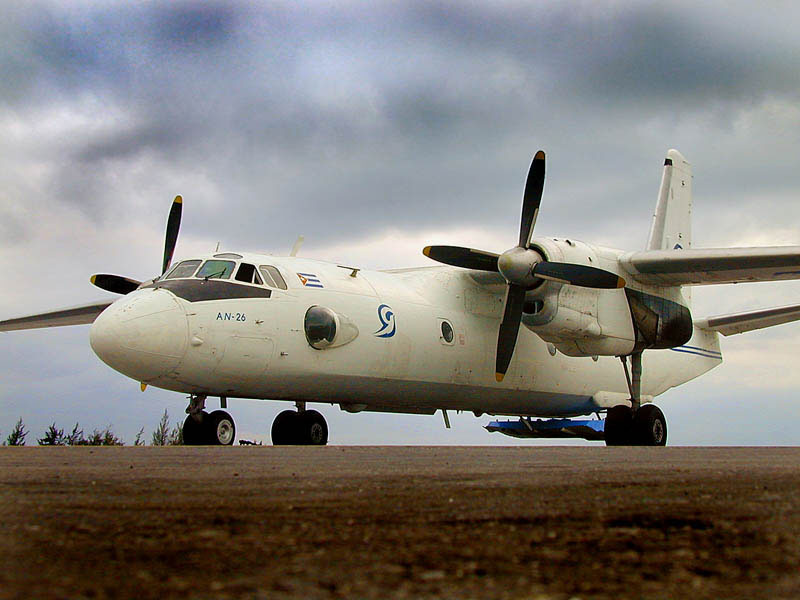 To the right is another AN-26 in present day domestic service, seen here on the apron at Cayo Largo.